When planning a trip, you may have a budget that includes items such as airplane tickets, hotel, rental car, and food. However, there may be a few unexpected costs that you haven’t planned on during your budgeting. Here are some common unexpected travel costs to think about while planning your vacations. Before booking flights, check the airline’s baggage fees. Also, be aware that there are usually fees for bags that weigh over 50 pounds, so it may be helpful to buy a suitcase scale so you can know how much your bag weighs before you leave for the airport. Some airlines offer deals for frequent fliers or those who book flights with loyalty credit cards. Many hotels, especially those in bigger cities, will charge you per night for parking. This information should be available on the website before you book so you can include it in your travel budget. On average, these fees run about $25 to $35 a night. Some countries charge you a tax when you leave the country by airplane. When booking your trip, do some research to see if there are any additional taxes you may need to pay. In some cases, the fees may already be included in your airline ticket. While you may be looking forward to disconnecting for a few days and enjoying your vacation, it may not be plausible to go completely off the grid. Some hotels charge by the day in order to access their Wi-Fi. If so, make sure you include this in your budget if you need to stay somewhat connected during your time away. 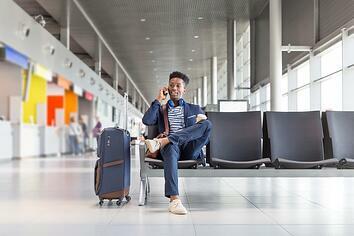 If you are traveling internationally, check what your phone plan may or may not cover. To help avoid these charges, turn off your phone's data or keep your phone in airplane mode. With both of these methods, you still can use your phone by accessing Wi-Fi.